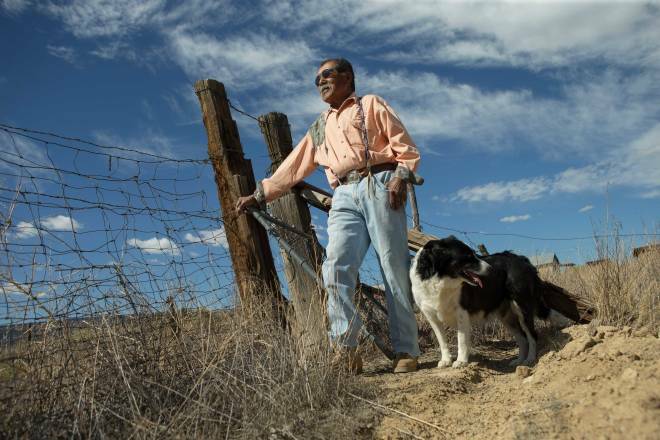 Above: Joe Lewis gazes at Laguna Pueblo with his best friend, Junior the border collie. JOE LEWIS RUMBLES DOWN US 93 in Nevada, the Great Basin Highway, over its craggy peaks and across its valleys. His navigator, Junior, is by his side, though he may not be much help in getting Joe the nearly 1,000 miles to his destination. A mellow border collie, Junior mostly sleeps. It’s up to Joe to pilot their way back to New Mexico, to the village of Paguate, on the Pueblo of Laguna, the place he was born in 1932. He hasn’t visited it since 1998, when he attended his brother’s funeral. “After that,” he says, “it wasn’t the same going back.” But a few months earlier, he got a wild hair to catch up with family and to carry out a special task. He called his only sister, Jackie, in California’s East Bay, and before he could reveal his plan, she guessed it. She bought her plane tickets right away. Joe wanted to drive. So he’s aiming his red pickup truck down from the Columbia Plateau and his home in Bruneau, Idaho, through the Great Basin, across the Navajo Nation, and on to Paguate. He doesn’t know when—or if—he’ll be able to make the long trip back again, so he takes advantage of the time he has to carry out his mission. First up is joining the crowd at Feast Day, an annual tradition at New Mexico’s pueblos where Catholic saints are praised with Native dances, friends break bread (and a whole lot of other food), and families reunite. While most pueblos allow visitors to watch the dances and stroll the markets, the feasts occur in private homes and require invitations—which are given in surprising doses of generosity. Laguna’s Feast Day is on September 19, while Paguate has its own on September 25. An experience unique to New Mexico, the yearly celebration fuses Spanish and Pueblo heritage in a polychromatic tumult of sound, sight, and smell. Both timeless and immediate, it pleasantly disorients: Dancers in traditional regalia tread the old streets and wend their way around centuries-old adobe buildings, sometimes with cell phones in hand. THE ASTOUNDING MESAS OF the Colorado Plateau dominate the 500,000 acres of Laguna land and stretch beyond the horizon in every direction, their amber colors morphing as the sun arcs through the sky. Ten miles up NM 279 from the village of Laguna, Paguate’s Feast Day starts, small but lively. Ceremonial dancers line up, ready to enter the square, decked out in bright tunics, shawls, and squash blossom necklaces. They hold traditional rattles and plastic bottles of water. The forgiving breeze carries with it the smells of fry bread dancing in hot oil, roasted corn seeping an earthy sweetness from beneath its husk, and mutton melting in a long, slow bath. Joe leans against a railing in the center of Paguate, talking to an old classmate he knows from the late 1930s, “when we were just little guys,” Joe says. He shuffles, leaning on his cane, over to the Arrowhead, a jewelry studio run by his son, Greg Lewis. The old adobe building, once a carriage house used by Joe’s father, Alvin Concho Lewis, is shady and cool. Glass cases show off the metalwork of Greg and his son, Dyaami. Behind the workbench hangs a black velvet painting of Vegas-era Elvis. A cloud of grandkids, grandnieces, and grandnephews quickly surrounds Joe. “Hey, knuckleheads!” he shouts. Some of these particular knuckleheads he’s never met. When the Jackpile-Paguate Mine, the scars of which sit only 50 yards away from the village, closed in 1982, Joe and his wife, Esther, moved to Nevada for work, and eventually to Idaho. In Nevada, he started putting to use the metalwork skills he had gleaned from his father, turning scrap copper that the mining company intended to throw out into stamped bracelets. With Junior, he still travels to rodeos and craft shows across the West, selling aluminum and copper jewelry in places that are “so beautiful” and meeting people who are “so nice,” the latest chapter in the life of a wandering soul. In 1976, Joe hitchhiked from Sanders, Arizona, just over the New Mexico state line, to San Francisco. He felt directionless—“at loose ends,” as he says—and decided to visit family. His father had moved to San Francisco to run a shop, and his uncle lived across the Bay in Richmond. He met Esther there, both of them on the streets and a little lost. Joe didn’t know it at the time, but she was the daughter of Henry Ford’s top union buster, Harry Bennett, and she was leaving behind his life of well-appointed paranoia. Joe did know that she was kind, adventurous, and feisty; just what a man at loose ends needed. They grew close, each helping the other stay afloat as they wondered what to do with their lives. When Joe bought a bus ticket to New Mexico, she joined him. It was a place that lingered in Esther’s memory for years. “Long after, she’d say, ‘I never felt so happy and so at ease as when we were out there,’” Joe says. Feast Day, and Joe’s homecoming, marks 11 years since Esther passed away. DANCERS FILE IN AND OUT of the Paguate Village square all morning, performing rituals that can be watched but not recorded, sketched, or otherwise committed to anything but memory. Friends, family, and visitors ring the square, perched in folding chairs and protected from the sun by umbrellas. Nearly every family prepares its own massive meal, and celebrants make a circuit of the homes they’ve been invited to, eating and visiting at each. As the sun hangs high at midday, the Lewis family’s meal is ready. Greg’s wife, Gloria, a prominent local activist, choreographs a ballet of dishes, people, and conversation. He sits at the table, overflowing with green chile stew and oven bread, turkey, stewed mutton, and even spaghetti. A familiar holiday atmosphere fills the room, and pies actually cool by the window. The village priests pass through, along with bikers covered in studded leather. Joe talks with them all. In between hearty laughs and stories of places he’s been with Junior, Joe pops pieces of red-chile-soaked bread into his mouth. His cousin Eddie, a retired anesthesiologist who lives in Taos, strides through the door, sees Joe, and offers a spirited “Welcome home!” After the meal, a fruit tree in the yard becomes the new haunt as people relax in the shade. Joe pulls a box of photos from his truck and begins going through them with Jackie, with Eddie, and with everyone who passes by to catch up. PAGUATE&apos;S FEAST DAY HONORS Saint Elizabeth of Hungary, the patron of widows and widowers. A few days before her feast, Joe made a personal pilgrimage to fulfill an old wish. “Going back this time, I made a special effort,” he says. With Jackie, he took some of Esther’s ashes to a spot about 20 miles south of Laguna that she had loved so well. Surrounded by the expanse of golden desert, steeped in memory, they released her into the wind that sweeps through the mesas. Back in Paguate, stomachs full and feet tired, things begin to quiet down as the afternoon wanes. His mission complete and Feast Day ending, Joe packs his photos back in their boxes and loads Junior into the passenger seat. They drive back to the highway, snaking their way north, heading back to—and away from—home. Wander among vendors selling Native crafts and cuisine. Experience buffalo, eagle, and social dances—but leave your camera in the car.